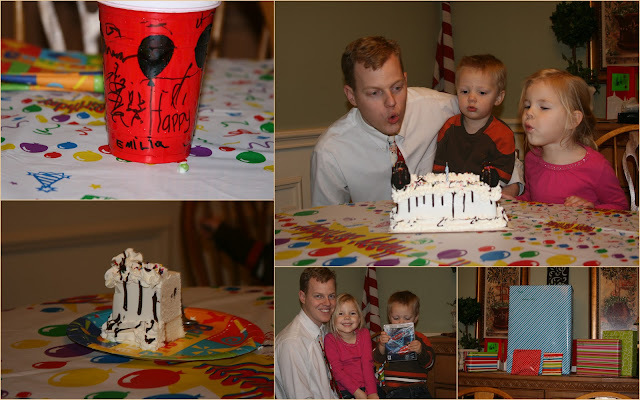 Todd celebrated his 35th birthday in December. Emilia help decorate for the occasion. She even made him a special birthday cup. As always it was difficult to think of enough gift ideas for his birthday and Christmas but I think he got a lot more than he expected. He was really surprised to receive a server (always the tech guy) that he'd been wanting for a long time. He also got a PS3 game to play with the kids. Thanks to technology, our kids and Todd get their cousins and uncle from Utah on speakerphone and play the new game together over the internet. It's been fun to see Emilia and Carson build a relationship with extended family even though we don't see them as often as we wished.